Geranium pratense. 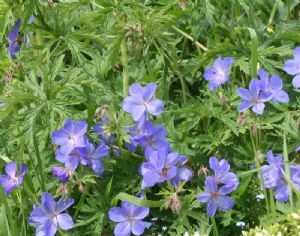 Such a beautiful, large flowered, vivid blue hardy geranium that it's difficult to believe it's actually a native wild flower! Flowers June, July and a second flushin late summer and autumn if cut back; attractive to bees and butterflies. Hardy clump-forming perennial; ideal in a border or meadow situation. It can grow to about 3 feet high in competition with grasses, but in the border tends to stay more compact, with lovely cut-leaves too. small packets of seeds currently available at £1.00.